Pioneers in the industry, we offer wool felt buffing wheels and wool felt polishing wheels from India. We offer various types of Wool Felt Buffing Wheels that are used for the polishing & buffing of metals as well as leather, plastic and rubber. These felt wheel buffs are made to suit as per the customers requirement. Moreover, these are manufactured as per the industrial standards to ensure high quality and longer life. 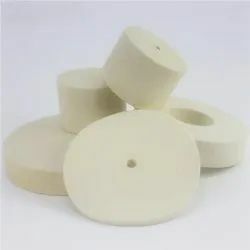 We are the leading manufacturers of wool felt polishing wheels used in many industries.